Minox DC6311 - Very small, ultra compact, great looking but sporting over 6 million pixels! 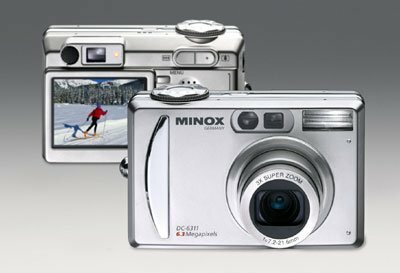 The MINOX DC 6311 with 6.36 million pixels is one of the smallest digital cameras of its kind and its elegant stainless steel body is host to a most impressive range of features. The 3x optical zoom and the large 2“ TFT color monitor make this small, attractive and well priced digital camera a very nice camera to own and use. The MINOX DC 6311 features a CCD image sensor with 6.36 megapixels and boasts a fast, high-performance multi-coated MINOCTAR lens. The 3x zoom lens with autofocus allows the user plenty of freedom to concentrate on actual picture composition while still operating the easily selectable shutter speeds and apertures. A combination of the 6.36 megapixel sensor and the MINOCTAR lens, together with the cameras electronics and the software of the MINOX DC 6311, ensures dynamic images with expected natural color rendition. The added option to select manual mode – for night-time, sports or portrait photography as examples – opens up new areas of creativity for the discerning amateur or ‘snap-shooting’ pro’s. The automatic white balance ensures correct exposure, even in difficult lighting conditions, providing the user with natural colors and the correct setting for the subject in view, every time. The four flash functions make use of the best available lighting conditions for the best use of flash at all times. A fast image sequence and minimal shutter release delay allow for spontaneous snapshots just when you need them. A whole new range of creative photographic possibilities are opened up by the inclusion of the video and voice recording features. The large 2.0’’ TFT color monitor lets you take a look at the image right away, both during and after the shot, and provides an excellent level of viewing, even in sunlight, thanks to the pin-sharp definition and overall brilliance of the monitor. The digital USB interface of the MINOX DC 6311 allows easy transfer of the image files to the computer. Using the software provided, pictures can be touched up on the PC and mailed directly to friends and family. Given its small size of just 94 mm x 35 mm x 63 mm, the new MINOX DC 6311 takes a deserved position in the range of compact high performance cameras. Included with the camera are a rechargeable Li-Ion battery, 32 MB SD Card, a case, wrist strap, USB cable, video cable, CD-ROM and user’s manual.